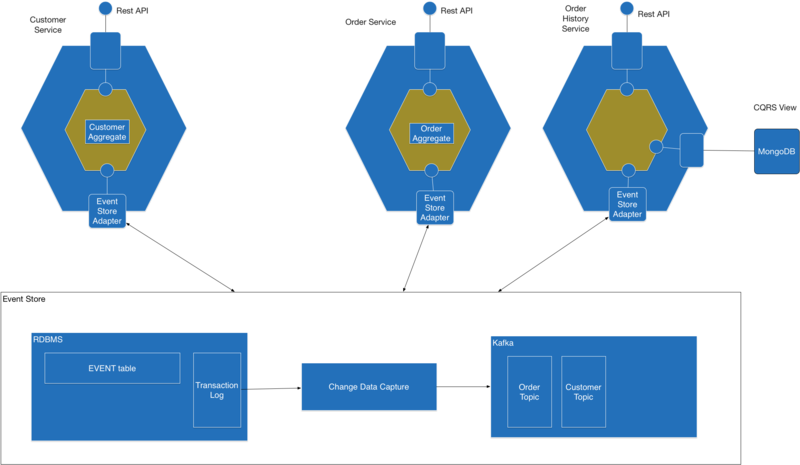 Eventuate™ is a platform for developing transactional business applications that use the microservice architecture. Eventuate provides an event-driven programming model for microservices that is based on event sourcing and CQRS. Eventuate™ Local is the open-source version of Eventuate™. It has the same client-framework API as the SaaS version but a different architecture. It uses a MySQL database to persist events, which guarantees that an application can consistently read its own writes. Eventuate Local tails the MySQL transaction log and publishes events to Apache Kafka, which enables applications to benefit from the Apache Kafka ecosystem including Kafka Streams, etc. Eventuate Local currently only supports Spring Boot applications but we plan to add support for other frameworks and languages over time. Look at the source code. This exception is thrown because of an incompatibility between the version of jackson-module-scala used by Eventuate and the version of Jackson JSON used by Spring Boot 1.3.3.